At the beginning of February, Latis Scientific completed their relocation into a new purpose-built laboratory in Crayford, Greater London. The state-of-the-art facility allows Latis to continue to offer reliable services to clients, whilst also meeting current growth requirements. Previously, Latis Scientific operated over 4 sites: an administration department in Canada Water, a registration department in Barbican, Chemistry Laboratory in Greenwich and Microbiology Lab situated in another site in Barbican. The new two-storey development brings together all of Latis’ team to work together under one roof, which enables more efficient communication between departments. The building was designed with the flow of sample analysis in mind; especially with bringing registration and laboratory departments in one location to aid efficiency. The new facilities lend themselves to accommodating clients; be it for one-to-one meetings with account managers, or laboratory tours to be able to showcase our unique offering. Furthermore, there have been many improvements to the functionality and efficiency of laboratory based work. These are most notably related to the increased space gained since the move and the better design of the new lab in comparison to the old premises. In Microbiology, increased space has enabled the team to separate some laboratory procedures. 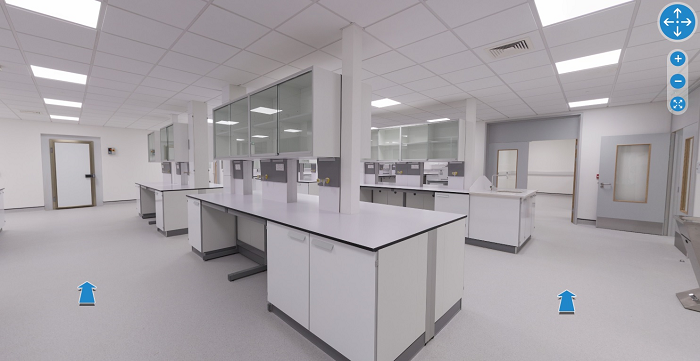 For example, PCR now has a separate space with two adjoining rooms, a separate dirty lab, decontamination room or Category 3 lab which, although still in progress, once finished will be of great added value. Also, to increase the capacity for filtration of samples, 4 new ramps and 2 vacuum pumps were implemented. In our Chemistry laboratory, we have a new ICP room which includes new ICP-OES equipment for metal analysis. The separate spaces and increase floor space within the lab again enables the team to improve the efficiency of sample processing. Due to our commitment to our clients, we have decided to keep operative the registration site in Barbican to provide an alternative delivery location in central London. You can see a virtual tour of our new facility by clicking the picture below.